On March 28th, 2008, an oversized plush mascot resembling the 26th President of the United States raced across some freshly cut grass. The occasion was the first ever President's Race at the newly constructed Nationals Park. Forty thousand people rose to their feet and laughed as they watched a giant Theodore Roosevelt screw around in the outfield and squander an opportunity to win the race. Teddy, as he is more familiarly known, crossed the finish line, but it was too late. He had lost. What started out to be a fun gag at the ballpark has turned into a metaphor for sports teams in Washington, D.C. Teddy is everything that DC sports are. In fact, you could say that Teddy IS DC sports. He is a loser. The last time that one of the major four DC sports franchises won a championship was when the Washington Redskins won the Super Bowl in 1991. After some quick math you will realize that the victory took place 21 years ago. Teddy hasn't won in over 250 races; DC franchises haven't won in over 21 years. So why do we watch Teddy run when we know that he is destined to lose? Maybe it is the same reason we watch the local sports teams when we know that they are destined to lose. We have hopes that maybe, just maybe, this will be the race. This will be the race when the Capitals don't collapse before the finish line. This will be the race when the Redskins don't run the wrong way. This will be the race when the Wizards don't run out of steam in the homestretch. 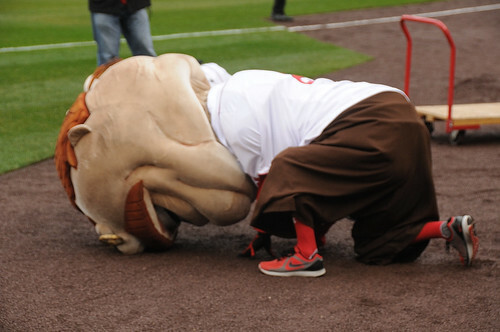 This will be the race when the Nationals don't get attacked by a giant pierogie? Just like Teddy, DC teams are often on pace for a victory, but in the end an egregious act causes their undoing. Whether it be a high stick penalty, a player bringing guns in the locker room, signing toxic free agents, or a coach quitting in the middle of a winning streak. DC always finds a way to lose. So next time you are at the ballpark watching a great President shamefully fail, take a second to think of the bigger picture. Teddy and DC may never win. As a fan all you can do is hope and scream...Let Teddy Win! Let DC Win!